Chanteur Folk US né le 5 Septembre 1939 à San Diego (Californie). John Stewart est décédé à l'hopital de San Diego (Californie), le 19 Janvier 2008. 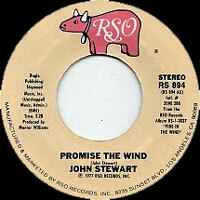 John Stewart first gained recognition as a songwriter when his songs were recorded by the Kingston Trio. 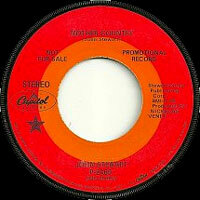 In 1960, he formed the Cumberland Three, which recorded three albums for Roulette. The following year, he joined the Kingston Trio, replacing Dave Guard, and stayed with them until 1967. His song "Daydream Believer" was a number one hit for the Monkees at the end of that year. Stewart traveled with Senator Robert Kennedy on his 1968 presidential campaign, an experience that affected him deeply. In 1969, he released his classic album California Bloodlines, the first of seven solo albums to reach the charts through 1980. 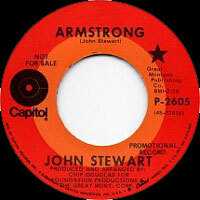 Stewart found his biggest commercial success with the Top Ten album Bombs Away Dream Babies and its single "Gold" in 1979. 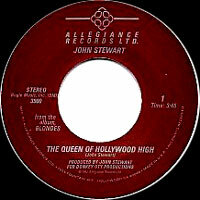 He released several of his albums and albums by others on his own Homecoming label starting in the 1980s. Airdream Believer appeared on Shanachie in 1995, followed by The American Folk Song Anthology on Delta in 1996. Rough Sketches and the live Bandera were released in 1997 and 1998, respectively, by Folk Era. 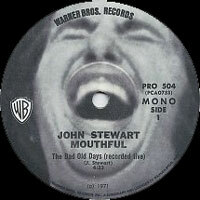 Stewart signed with Appleseed Recordings in 2000, and his next three albums, Wires from the Bunker (2000), Havana (2003), and The Day the River Sang (2006), all appeared on the Appleseed imprint. Following Stewart's death on January 19, 2008, in San Diego, CA, Folk Era released a previously unheard live set (recorded at the Celebrity Theatre in Phoenix, AZ, on November 30, 1973) as Bite My Foot in 2009. 10/1957 SP VITA 45-V-169 (US) . 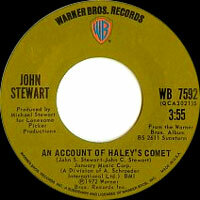 1971 SP WARNER BROS. PRO 504 (US) (promo) . 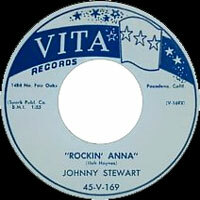 06/1973 SP RCA VICTOR 74-0970 (US) . 09/1973 SP RCA VICTOR APBO-0109 (US) . 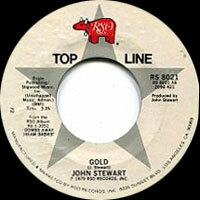 07/1974 SP RCA VICTOR PB-10003 (US) . 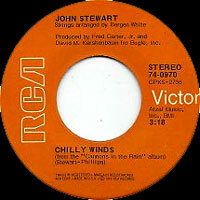 03/1975 SP RCA VICTOR PB-10227 (US) . 04/1978 SP RSO RS 894 (US) . 04/1980 SP RSO RS 1031 (US) . 1980 SP RSO Top Line RS 8021 (US) . 1982 SP ALLEGIANCE 3900 (US) .